Amazon wants you to send lots of 3D scans of your body so you never need to return clothes you bought online. We’ll pay you for 3D scans of your body. No, it’s not a proposition you’d find on Craigslist. We’re asking for a friend — that is, for Amazon. Those scans are part of the company’s latest (almost) too-weird-to-be-true project. According to a report from The Wall Street Journal, Amazon is offering $250 gift cards to people willing to send in 10 3D body scans over the course of 20 weeks. The goal of the project, Amazon says, is to improve the retailer’s understanding of how bodies change shape over time. The WSJ claims to have seen the online survey Amazon is using to solicit participants for this project. The survey reportedly includes questions about the person’s current weight, their fitness level, and any plans for future weight loss. It also notes that the 3D body scans would require 30 minutes each and occur in New York City. Amazon’s 3D body scanning unit, which sprung out of its 2017 acquisition of Body Labs, a New York-based computer vision startup, sent invites asking people if they were interested in participating. If so, those people needed to fill out an online survey. From those survey results, the unit will choose its participants. Prior to its acquisition, Body Labs’ website reportedly noted its tech could “be used by fashion e-commerce retailers wanting to offer sizing recommendations,” and that might have played a part in Amazon’s interest in the company. Because of free shipping and lax return policies, people are returning stuff they bought online pretty darn often — 20 percent of purchases bought online are returned, compared to the 9 percent for items purchased in store. Essentially, people are using their homes like fitting rooms, ordering multiple sizes of items and returning whatever doesn’t fit. Digital Commerce 360 has a suggestion for e-retailers looking to decrease returns: make sure the customer knows exactly what they’re buying. That’s difficult because clothing sizes — especially for women — vary pretty widely. A person who wears a medium in one brand might find a small more suitable in another. Startups have popped up to address the problem of trying to buy something online that fits when S, M, and L are effectively meaningless. Savitude, an online marketplace for women, is using visual recognition technology to match items in a retailer’s inventory with one of nine body types. The idea is that customers will then purchase items expected to suit their shape, not necessarily their size. 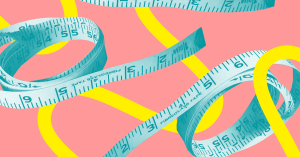 Meanwhile, Swedish startup Virtusize created a platform that lets users compare the dimensions of clothes they already own with online items they’re considering. For the best fit possible, startup CALA lets users upload photos of themselves. Those photos are then matched to one of the 1,000 3D body scans in CALA’s database, and fashion designers customize pieces to fit those specifications (and for prices like that, they better). Until Amazon decides to speak on its 3D body scan project, though, there’s no way of knowing just how it plans to use its body scans. For now, though, we’ll optimistically assume they’re for a project like CALA’s, and not something else much creepier.